The new BAR SYSTEM X4 is our lightest bar ever! Tons of new features to offer you maximum performance and safety. With just 23mm diameter it is the thinnest bar on the market, providing maximum feedback and grip. The Bar System X4 fits to all GA Kites by adjusting the stearing lines to the bar. The ROPE CLAMP avoids tangling of the adjuster line. 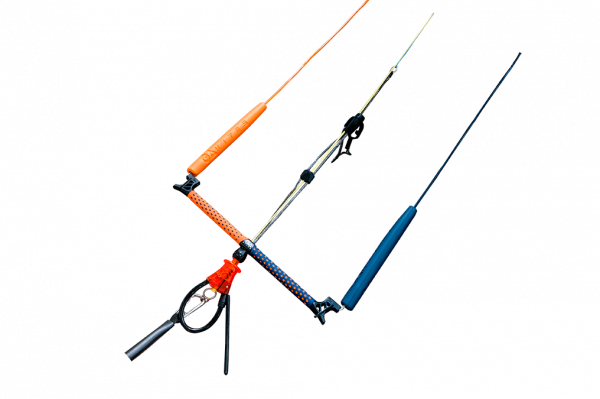 Use the 21m for most direct and fastest kite setup or 24m for more power and high jumps. One bar does it all. The BAR SYSTEM X4 offers maximum comfort on one handed tricks by using a new metal center and a thin depower line. This bar sets a new standard in performance, design, comfort and safety. Kapcsolódó linkek "BARSYSTEM X4 complete"
Vásárlói értékelés "BARSYSTEM X4 complete"